Dagor Agalareb (60 Y.S.) 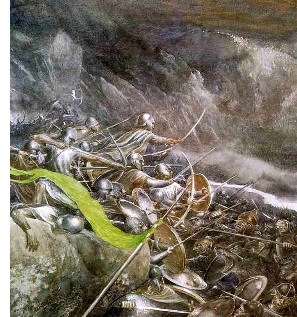 - Also known as the Third Battle of Beleriand (Dagor-nuin-Giliath being the second), it was an all-out assault by Morgoth in an attempt to drive out the Noldor from Beleriand. After the battle, Morgoth and the Elves fought what amounted to a war of attrition for almost four centuries. The Noldor laid siege to Angband but could not penetrate its walls, while the armies of Morgoth did not dare venture forth and engage them in open battle. The stalemate was finally broken at Dagor Bragollach in 455 Y.S..